Bethesda E3 2018 Press Conference Date and Time Announced | Nerd Much? E3 2018 is still a few months away but Bethesda has already sent out invites to their press conference, which will occur on June 10 at 6:30pm PT/9:30pm ET. 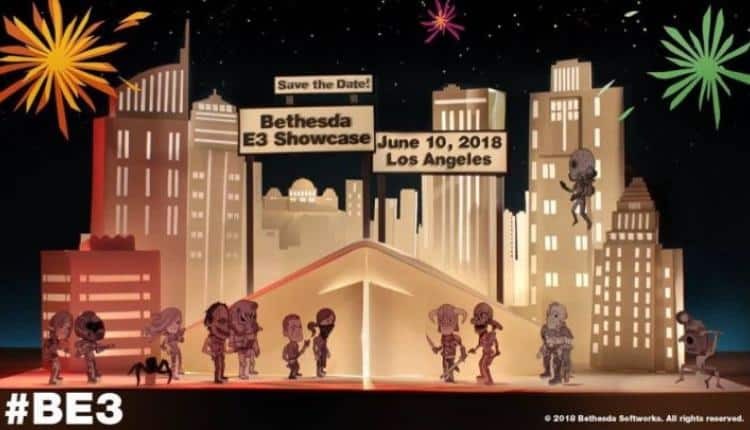 The invite image shows us a different theme from last year, including a paper cut out of a city and little paper puppets of various characters from Bethesda’s games, including Fallout, Prey, The Evil Within 2, Dishonored 2, Doom, The Elder Scrolls, and more. Bethesda has not announced exactly what they will be showing off this year, but if last year is anything to go by, the conference will be on the lackluster side. E3 2017 was lackluster in general, but Bethesda was especially uninteresting. Their announcements were nothing the average gamer could not have guessed. Since then, however, we have received plenty of great titles from Bethesda, including The Evil Within 2, Wolfenstein 2: The New Colossus, and Skyrim on the Switch. We hope to see more original and new IPs from Bethesda, and not just additions to already existing games. However, if we hear Wolfenstein 2 in VR, fans of the publisher might just get up and leave right then. Little is known about E3 2018 at the moment, and it is a little early to start making predictions. We do know that E3 2018 will be open to the public again, though all of the press conferences will occur before the floor is open to everyone. The main E3 exhibits will be open to industry pass holders and the public on Tuesday, June 12. The press will get access at 11am and the public won’t hit the floor until 2pm that afternoon. The only confirmed games that will be at E3 2018 are The Last of Us Part II, Anthem (BioWare’s new multiplayer title), and Battlefield 2018 (rumored to be set in WWII). On the unconfirmed but very likely side, we have Cyberpunk 2077 (evidenced by CD Projekt Red attending the conference), Days Gone (again), Kingdom Hearts 3, Spider-Man, and few less likely ones. What games do you hope to see at E3 2018? What about console features or new gaming technology? Let us know in the comments below!